Adobe was scheduled to come to the April 1999 General Meeting and talk about InDesign, the program they are touting as a "Quark killer." (Nuclear physicists are somewhat concerned about this characterization.) At the last minute, Adobe sent every available body to a sales meeting in Texas, which isn't very close to Maryland, DC or Virginia, so the Pi put on its own Adobe presentation using the talents of Pi members Pat Fauquet and Mary Keene. 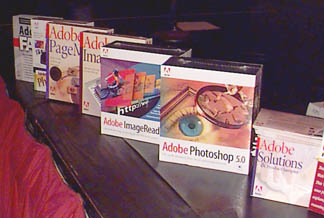 Oh, yes: we also gave away all the software Adobe shipped us for door prizes.